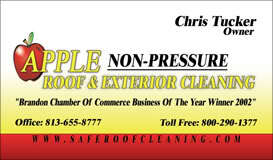 Here is a Tampa Tile Roof Cleaning Video we made, some time back. Please don't hold it against me. I am a much better tile roof cleaner then I am at making videos. Many of these Tampa area tile roofs were not able to be done w/o using lifts, as you can see in the video.